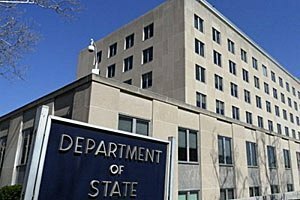 The State Department lambastes repressions against the Crimean Tatars by the occupation authorities. The US call on the Russian Federation to reverse the Ministry of Justice’s recent decision to designate the Crimean Tatar Mejlis as an “extremist” organization. "The Mejlis has long been a representative body for the traditionally under-represented and historically oppressed Crimean Tatar population. It has also served as an important independent voice in preserving their culture and protecting them from discrimination," said John Kirby, Assistant Secretary and Department Spokesperson, Bureau of Public Affairs. Washington stresses that Russian authorities have no basis or jurisdiction to assert Russian law over Tatar conduct in Ukraine. "The decision by de facto authorities in Crimea to suspend this democratic institution ", - подчеркивается в комментарии Госдепа. John Kirby insists that "a ban on the Mejlis would prohibit it from convening, publishing its views in mass media, or holding public events, which contravenes basic democratic principles. This action is the latest in a series of abuses perpetrated by de facto authorities against those in Crimea who oppose the occupation". Such abuses include arbitrary detentions, beatings, and police raids on their homes and places of worship, Kirby goes on. "We again call on Russia to end its occupation of Crimea and return control over this piece of Ukrainian territory. Sanctions related to Crimea will remain in place as long as the occupation continues," John Kirby concluded.